I am sure you have all heard of the vivacious artist Pascale Sellick by now? The story of her forthcoming nuptials has spread throughout the world. Receiving 130k shares on Ladbible in less than one day! 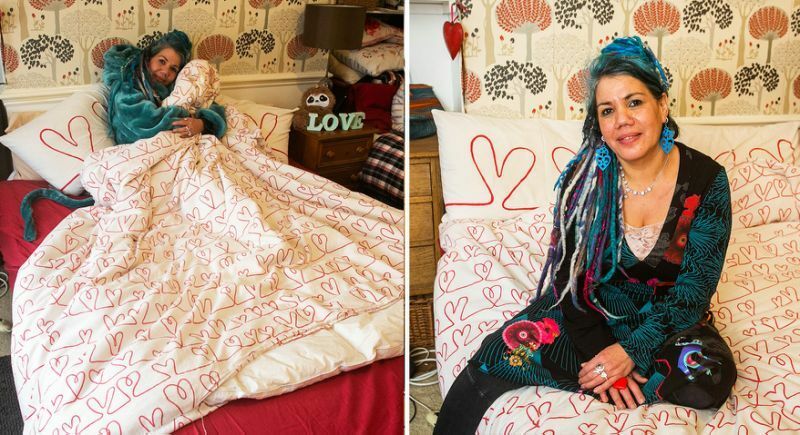 Pascale will be declaring her love and 'marrying' her beloved duvet on Sunday 10th February at 2pm at Rogemont Gardens, Exeter, Devon. The dress code for attendees is sleepwear of course – think pyjamas, slippers, dressing gowns. You can 'bring a bottle' – a hot water bottle that is! To keep yourself warm if its a bit chilly. After the vows, the wedding party will head over to The Glorious Art House at 120 Fore Street, Exeter for the wedding reception, where the cake will be cut and the bride & duvet will have their first dance. Its a small and intimate venue so we will be performing acoustically and playing our usual mixture of fun pop, britpop, indie and a touch of rock interlaced with cool classic tracks. The aim is to liven up the party, get everyone singing along and to celebrate the reasons behind this amazing event. As a professional wedding band with over 10 years experience, Quite Brazen have had the pleasure of providing the entertainment for hundreds of couples. Pascale & Duvet are their first Art Wedding. What is interesting about this event is that woohoo is also making art accessible to all in a way that involves everyone. How many bridesmaids? As many who want to come along dressed as bridesmaids. The people who join in the event become a piece of the event themselves. Not just bystanders, but wedding guests. Picasso once said “Art washes away from the soul the dust of everyday life”. This rings true for this event. Break out your slippers and dressing gown and join Pascale & her Duvet in celebrating self care. Loving yourself is so important. Lets face it, we have all wanted to take a duvet day at some point or another. Turning to your personal space for comfort if that is the only place you feel safe. The message is that there is no need to be lonely, come and celebrate with us all. Join the party, make some new friends and be a part of this living work of art. An inclusive art event, opening up important discussions about loneliness, self love and looking after yourself. Breaking down those barriers.